My garden is overgrown with all sorts of vegetables and flowers. I love it!! My tomatoes are tall - 15 feet or so. Peppers, at least 5 feet tall. Squashes, watermelon, and beans are rambling all over. I'm harvesting, canning, and pickling almost every day. And weeding, staking, planting fall crops, and pulling past summer crops. Gradually the summer is moving towards fall. We have temps of 90F coming tomorrow, but that seems like it may be our last hot day. Our nights are cooling off. All we need is a bit of rain. Hurricane Hermine brought us about 0.3 inches. Nice, but not really very much. I think we're still near 10 inches short here this year. I think the dryness and heat have helped to make this a really good year for many vegetables - as long as we've been able to irrigate. My tomatoes are great and many other nearby gardeners tell me the same. Lots of big fruits and low amounts of fungal diseases. Also peppers, eggplants, melons, cukes, squashes and other warm weather vegetables are doing great. I like your trellising system. 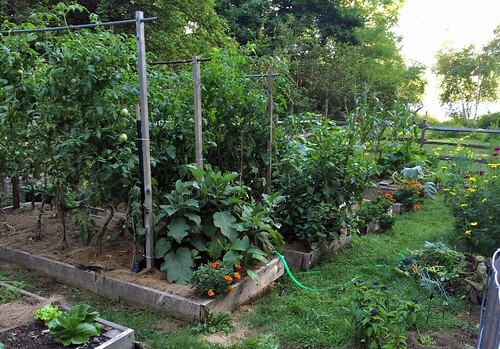 Do you rotate beds each year or just leave them in place? I rotate them on at least a three year schedule. The trellis system is very flexible. They will come down soon for winter. I usually plant garlic in the old tomatoes beds after amending with compost. I'm still deciding what to do this year with the garlic. Would love to see more posts about the trellis! Especially if you move them. I need something similar for my raised beds at my community garden plot.